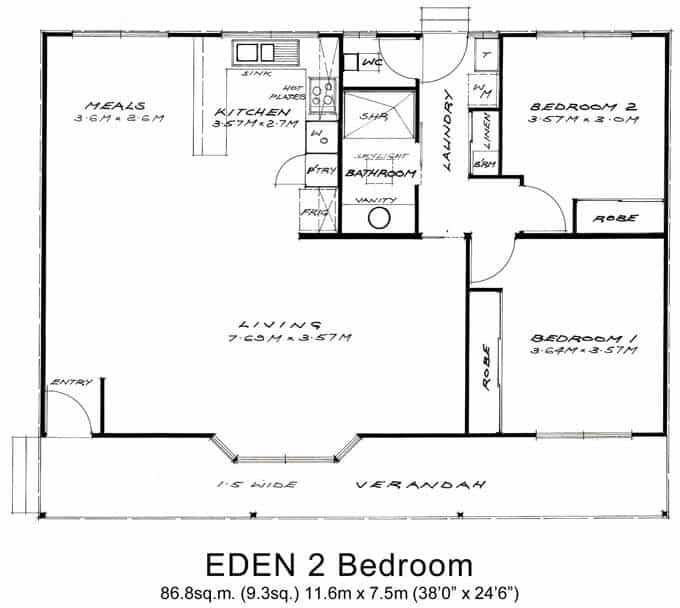 The larger of our two bedroom granny flats is the Eden Original. Measuring 11.6 x 7.5m and totalling 86.5sq.m. (9.3sq. ), an enormous combined Living/Dining and Kitchen area greets you as soon as you step through the front door. Both bedrooms have generous-sized robes and can easily fit a double bed. As in the Sandridge, a large 1.5 shower recess is located in the sky lit bathroom along with a full-width vanity and heater/fan/light. The W.C, laundry with stainless steel trough and Linen/Broom cupboard is separate from the bathroom. The Eden, like the other cottages, has a 1.5m wide verandah along the entire length of the home. this granny flat, the verandah is removed and the home is separated into 2 sections and transported/relocated in 2 pieces. If you require more information on our 2 bedroom granny flats in Melbourne or would like to obtain a plan and price of the Eden Original please Contact Us or please read our Frequently Asked Questions page. 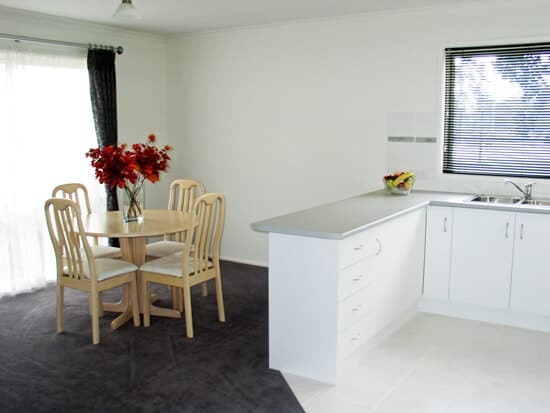 Looking for the most convenient and affordable two bedroom granny flat in Melbourne? Willow Grove is your trusted partner in all things related to granny flats. 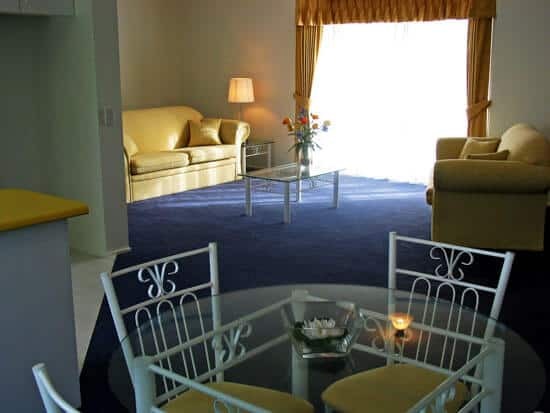 As specialists in 2 bedroom granny flat designs that suit your comfort, aesthetics and quality needs, we bring you the best of options in two bedroom granny flats. We pride ourselves on being “Energy Efficient” in everything we do. When you choose us for your two bedroom granny flat requirements, you are not only getting the most modern, convenient, high-quality and long-lasting solutions but also these amazing "green" benefits including 6 Star Energy Rating and LED globes. We offer two best-value, comfortable two bedroom granny flat designs to optimise functionality and comfort. 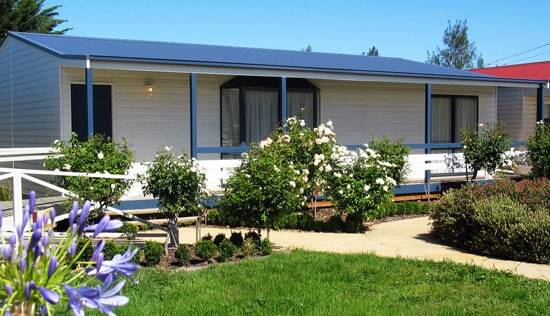 Small 2 bedroom granny flats Elegant Elwood 2 bedroom granny flat/relocatable home For those looking for a 2 bedroom granny flat that is compact enough to fit into any kind of space, the Elwood 2 bedroom granny flat is the ideal choice. Measuring 57.3sq.m or 6.2sq.overall, this 2 bedroom granny flat is bigger than the 1 bedroom version. With two conveniently-sized bedrooms located at opposite ends of the flat, each with the comforts of a built-in robe, the granny flat is perfect for those who need more space or to accommodate guests for an overnight stay. The bathroom meets all your function, comfort and style requirements- there is a high-quality aesthetic corner shower recess, as well as heater/fan/light and washing machine facilities. Sandridge granny flat/relocatable home The Sandridge granny flat measures 10.2m x 7.5m with the total area being 76.5sq.m. (8.2sq). A larger, well-defined Living & Dining zone, a generous kitchen with an island design and the 1.5m verandah add to the charm of this granny flat. 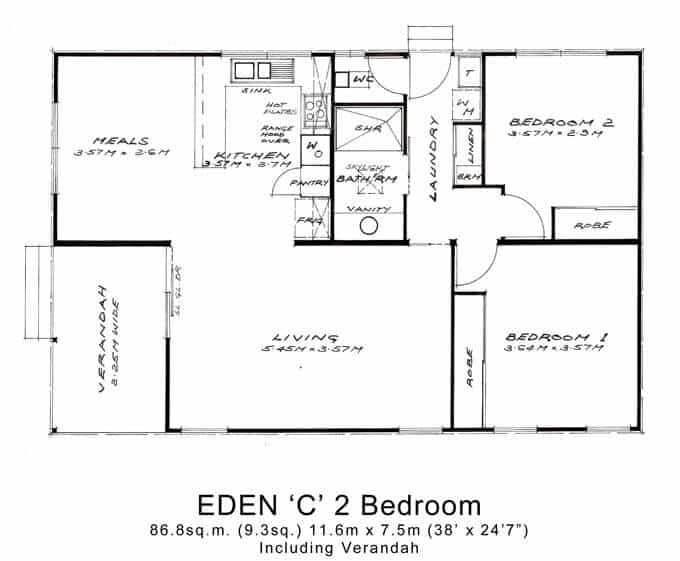 The Eden C is a modified version of our popular Eden 2 Bedroom granny flat floor plan pictured above. Also measuring 11.6m x 7.5m, the bedroom and bathroom areas remain the same as in the original Eden 2 Bedroom. However, the living and dining areas are a little smaller. This is because we have removed the full-length side verandah and replaced it with a delightful deep entry porch measuring 2.25m x 3.75m (see floor plan), thus reducing the size of the areas slightly. The kitchen remains the same as in the above Eden, meaning there’s plenty of room to cook up a storm! Create your dream home with Willow Grove Homes & Granny Flats’ 2 bedroom granny flats, anywhere in Melbourne. With a range of classic styles available, there is guaranteed to be a design to suit you. 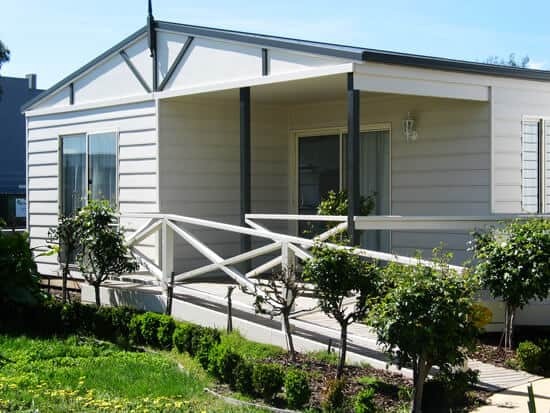 If you require more information on our 1 bedroom granny flats in Melbourne or would like to obtain a plan and price of the Hampton please Contact Us or please read our Frequently Asked Questions page.